Call me crazy, but I’d rather ride on my trainer than ride outdoors. In fact, training almost exclusively on a trainer over the past two years has made me a much stronger cyclist than I ever was when I hit the roads more often. But it’s not just about getting stronger and faster—there are so many other reasons I prefer keeping things more, well, stationary. Here are eight of them. For me, riding outdoors becomes super uncomfortable (and just not that much fun) once the temperature drops below 50. On a trainer, it doesn’t matter if it’s cold or windy or rainy outside. In the comfort of a controlled environment, you avoid the elements all together. So instead of worrying about whether I’ll ever regain the feeling in my toes and fingers, I can focus solely on crushing that next tough interval. 7. It’s a sweat fest. When you eliminate the annoying obstacles of outdoor riding (think: stop lights, potholes, railroad tracks), you can really nail a specific workout. I know too well the frustration of heading outside and trying to hit prescribed paces or stay in specific power zones only to be slowed by something I couldn’t control, like traffic or the terrain. On a trainer, you remain in control at all times, which tees you up for a high quality workout. 5. It’s easier to do drills. I admit to eye-rolling drills when I see them on my training plan, but I know my coach isn’t trying to torture me. When you’re trying to get better at any activity, whether it’s cycling, running, swimming or another sport, the littlest tweaks can produce the most gains. And that’s where drills come in. On the bike, drills that dial in pedal stroke efficiency or cadence are much easier to do when you’re on a trainer. Even better if you have your trainer set up in front of a mirror, so you can watch yourself...and learn. I have three kids, so the trainer is my life raft when my husband is traveling or working long hours and I have a hefty workout looming. Just being able to head down to my basement in the mornings when the little ones are still snuggled up in their beds is such a simple joy. Or, if I had a crazy day and don’t get around to training ‘til it’s dark out, I can still make it work on the trainer without having to stress about how to squeeze it all in. 3. It’s better to track improvements. Since I tend to do the same or similar workouts on the trainer from week to week or month to month, it’s fun for me to compare. I instantly upload my data to an app so I can easily track my progress, making me more mindful of any areas that may need work. Again, by eliminating certain variables like the terrain and weather, the results are just about you and the bike...no excuses. Sure, outdoor cycling is a great group activity. But riding behind your friends and sucking their tailwind isn’t quite conducive for chatting. 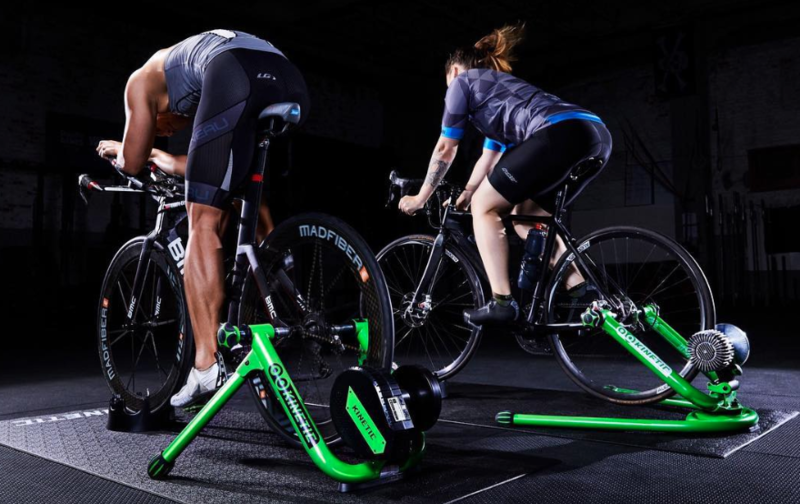 What I love about the trainer is that I can bring it anywhere and set it up alongside a training buddy and we can catch up—and motivate one another—while cranking out the watts. No aggressive drivers. No wayward squirrels. No tube-popping potholes or kit-ripping concrete. Riding on trainer is simply safer than riding outdoors. And this is coming from someone who has fallen off her trainer. Twice. Hey, it happens!